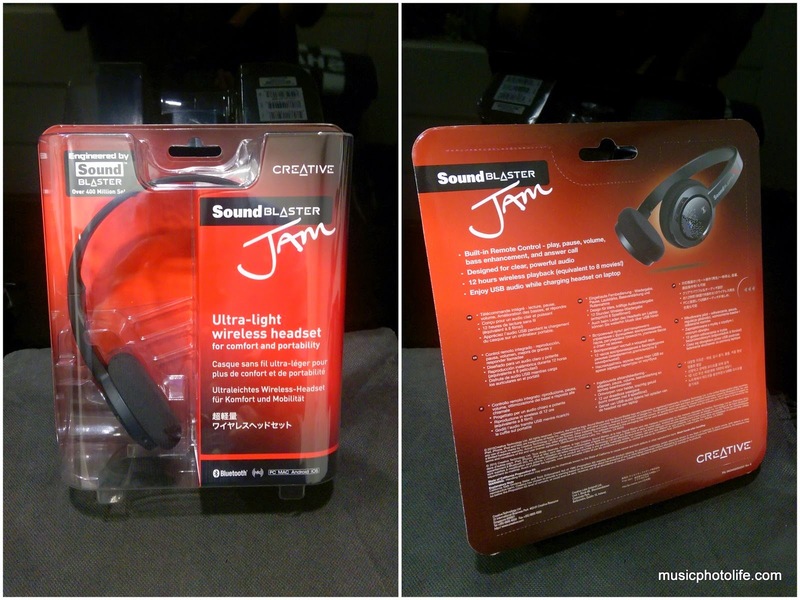 Creative's PR agency, August Consulting, informed me of a new audio product available in Singapore, called the Sound Blaster JAM. Doing my part to support local brand, I agreed to take in for a review. The product arrived in a sealed packaging with perforated rear panel that requires ripping apart. The headset itself is constructed entirely of plastic mould, devoid of any padding around the headband or design detail. The speaker units do not even have any joints for tilting to fit your ears. It looks deceivingly low-spec. Yet, this headset is NFC-capable, Bluetooth-enabled, has a 12-hour battery life, supports voice calls. Its speakers are made of 32mm Neodymium drivers that pumps 20-20,000Hz audio, it has a Bass enhancement button, volume button, power-play-pause-call-pair multi-button. The overall impression of the Sound Blaster JAM: highly-detailed, somewhat exaggerated, but not overbearing treble, and relatively balanced but not strong bass. Turning on the bass enhancement provides some boom to the mid bass volume and adds balance to the biased treble, but still does not deliver the mega-bass feel. Audio is roomy and wide but the left-right channels felt detached. The on-ear headphones do not offer sound isolation both ways (ambient noises are audible, and people around you could hear sound leaks from the headset), but it feels exceedingly comfortable to wear, as the weightlessness bears no stress over your head or on your ears. The JAM does not come with 3.5mm audio jack, so the only wired listening option is via the standard micro-USB cable which is included in the package. Plug it to any computer and you will get digital audio. 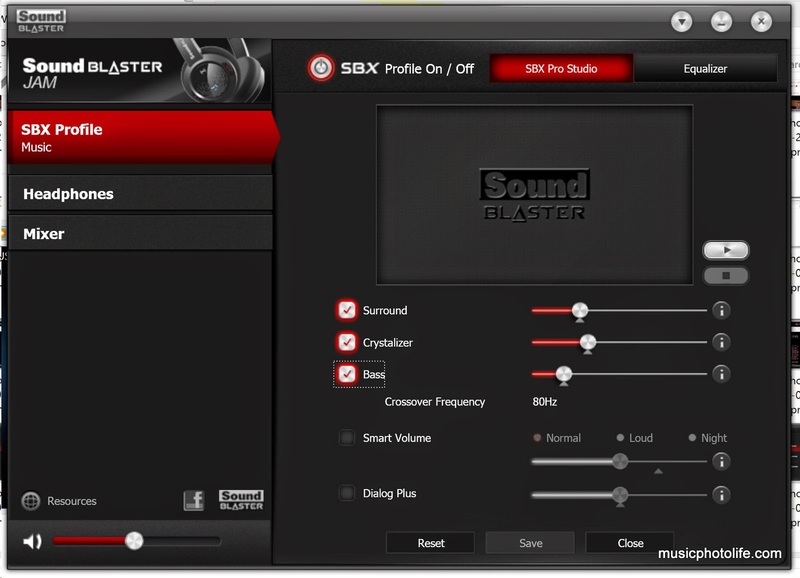 Install the Sound Blaster JAM software and it will further enhance the audio output, adjustable to individual taste. I like that you do not need to turn on the headset to pair using NFC. Simply bring both devices together and the Sound Blaster JAM springs to life, waiting for you to accept the pairing on the smartphone. The headset can store a few devices and you can easily switch connection with multiple devices manually without having to re-pair again. The Sound Blaster JAM is a budget headset with all the wireless features you can expect only from a mid-priced wireless headphones. It does not offer premium sound quality and balance that critical listeners demand. The speaker drivers are tuned to deliver sparkling mid-treble, ideal for instrumental and jazz. The bass enhancements gives the lower frequency some boost but only for the feel and not for details. Now selling at an introductory price of S$69 at the Creative e-Store, it makes a great gift for anyone trying out wireless audio and voice calls for the first time. NFC support with Advanced Multi-point connnection.